janet, i'm also curious whether any focus groups or other form of listening have been done to figure out how people think of fruits & veggies dispensed from a vending machine. it seems logical that there would be less interest in purchasing them in this format, since most of us must equate vending machines with long shelf life. seems like designing the cafeteria to up fruit/salad purchases and bringing in healthy vending machine options is a strong place to start. I agree that fruit would be a tough sell--I would rather get my fruit from a bowl than a machine. Probably has to do with not being able to handle it to insure quality. 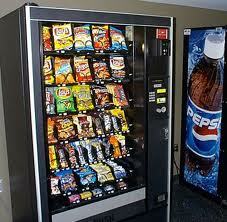 I would say that you can’t be 50% healthy in a vending machine--that is a mix of healthy/ non healthy snacks. The non-healthy will always win out in a weak moment. I read your post last night and then again this morning. There are a lot of elements in your post with which I agree. But, let me make this personal as you did, and share something from my life. My career requires me to travel a lot. It always has. And, yes, I, too, travel with an array of healthy food options. When I want food, I'm usually hungry and fast food/junk food/even great chocolate, doesn't do it for me when I need nourishment. But there are simply some days when I'm sick of packing provisions. After all, I'm not going on a trek through the desert. I'm just going to work or a client's office or on a plane. And, I travel so much, I can't always make it to the regular market, never mind the farm market...and I live in farm country. So, yes, sometimes I find myself standing in front of a vending machine trying to find something to eat that will somewhat nourish me. More often than not, I've had to choose the tuna in a can with crackers despite the fact that it's generally unappealing to me. But what are you going to do at 7 pm at night in an almost deserted office where the only food you find on people's desks is candy? And, I'm not alone. I've encountered plenty of people staring at a vending machine around the same time, desperate for something good...sometimes in addition to the Hershey bar. But, there is the opposite side of the argument, which is that most people approach a vending machine wanting and expecting chips or candy. Heck, I've done that on occasion. Nothing wrong with that as long as it's not a regular habit. Everything in moderation, I say. I'll tell you a strategy we did with one employer. We created healthy vending machines with choices that were selected by the employees and put those near the general work areas. We also stocked one vending machine with the usual array of candy and chips and placed that at the farthest reaches of the building. Our theory was that you have to treat people like adults and, yes, at least it was inconvenient and they had to walk there. The strategy worked pretty well. We found that consumption of food at the healthy machines went up. The vendor told us they were making more money from those machines even though we lowered the prices on the healthy choices. And, yes, people went to the "unhealthy" vending machines, but volume was down. So, that's too long a post from me. Know that you made me think and that's always a good thing.